James Walker, aka James Mikell was born on Peters Point Plantation, Edisto Island, SC about 1845. He was enslaved by Jenkins Mikell. His father’s name was Harry Walker. James went by both Mikell and Walker surnames, Mikell after his slaveholder and Walker after his father. George Bright, who was also enslaved by Jenkins Mikell, testified that his sister was James’ mother. In April of 1902, Peter Bright testified that James Walker’s mother was then living on his (Peter Bright’s) place and was then 78 or 79 years old. James’ first wife was Christiana Jones, who died about 10 March 1873. George Bright testified that James and Christiana were married in 1867. Bright stated that Christiana was his first wife’s child. He was married to Mary Ann Green about 4 January 1875. Mary Ann was born and raised on Edisto Island. She was enslaved by the Whaley family. Her father’s last name was Green. Mary Ann was married to James as Mary Ann Green. James was married as James Walker. 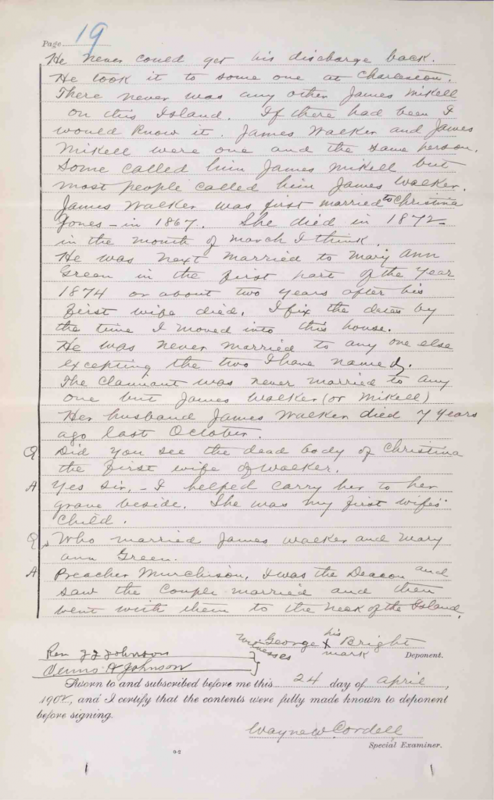 The church record of their marriage and James’ death were lost or destroyed by a church secretary who had died before Mary Ann filed a claim for a pension as James’ widow. They had two sons, Cornelius, born in July 1880 and James, born in October 1881. 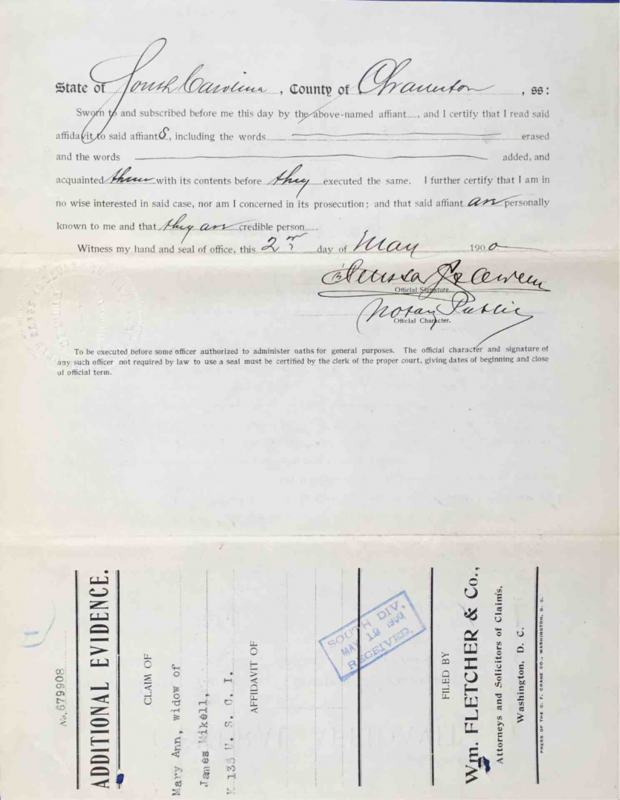 Children under the age of 16 who were living at the time of Mary Ann’s 1898 statement were: Minnie Victoria, born 26 December 1886 and Mary Bell, born 20 May 1891. A child, Nellie, born 2 July 1893, died at the age of 5 months. Cloe Williams was the midwife who was present at the birth of Mary’s daughters Minnie Victoria and Mary Ann (nicknamed Mary Bell). Martha Swinton assisted Cloe Williams in delivering Mary Ann Walker’s daughters. James Mikell died of heart disease about 18 October 1894 on Edisto Island, SC and was buried on Peters Point Plantation on Edisto Island. Major Frazier helped make James’ coffin, and James was carried to the gravesite in Peter Bright’s cart. 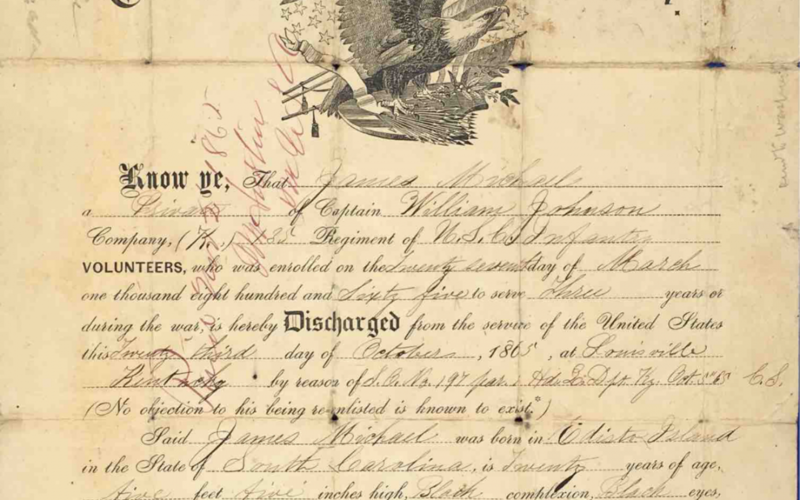 Summary of Discharge Certificate, 23 October 1865: James Michael [Mikell] was a private in Capt. William Johnson’s company, Company K, 135th Regiment US Colored Infantry. James enrolled on 26 March 1865 to serve for three years of during the war. 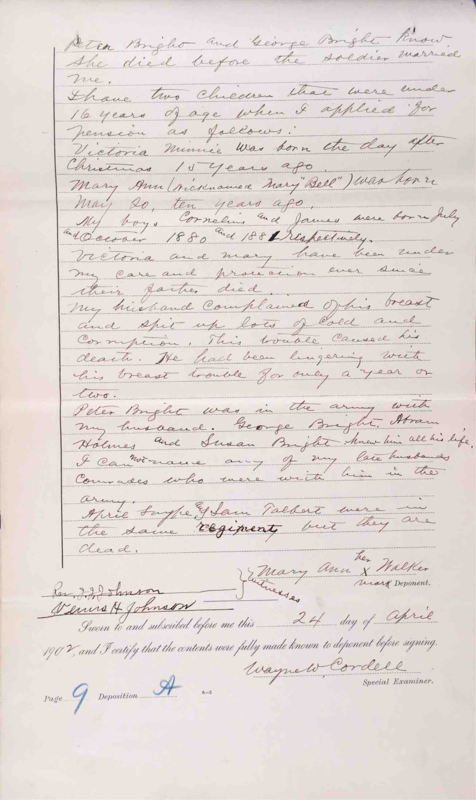 He was discharged 23 October 1865 at Louisville, KY. He was born on Edisto Island, SC and was 20 years old when he was discharged. He was 5-feet 5-inches tall with black complexion, eyes, and hair. When he enrolled, his occupation was a laborer. 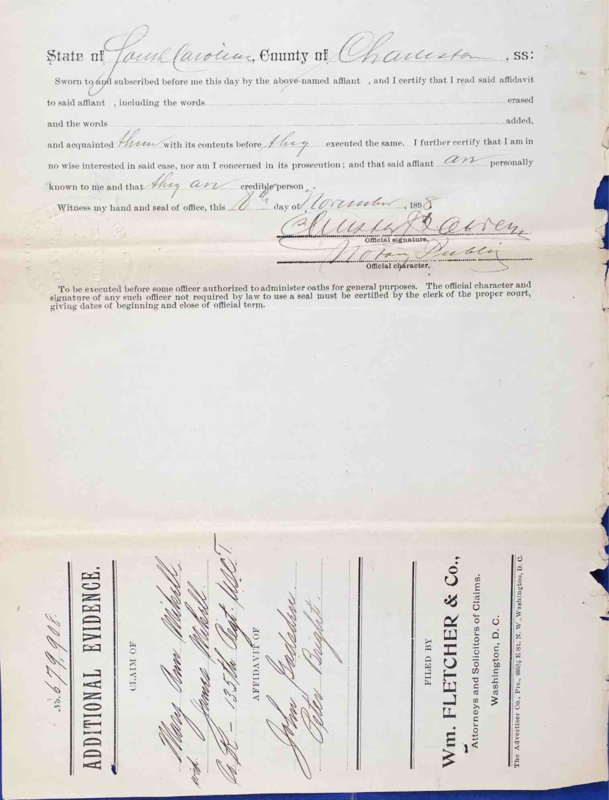 His son had found this certificate among the effects of his father who died in 1889. 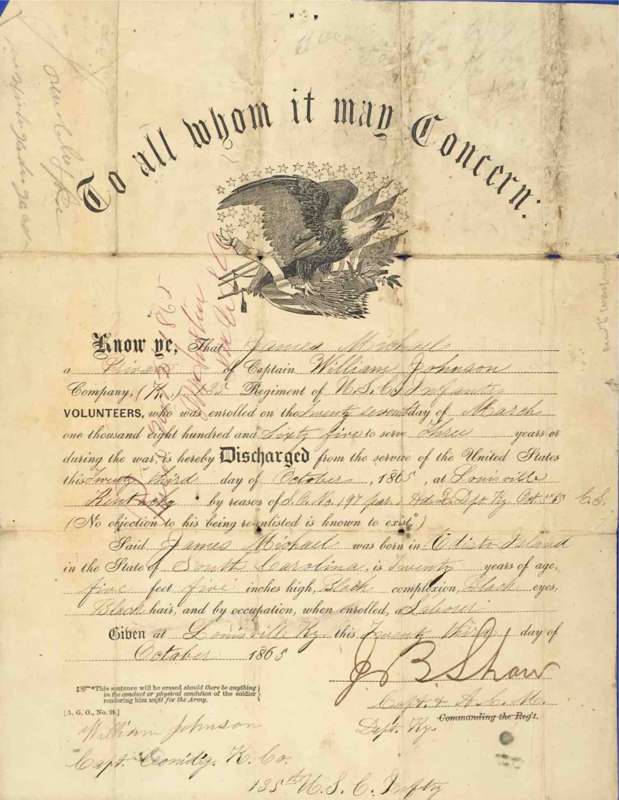 Discharge Certificate, USCT Pension File of James Walker aka James Mikell, Certificate #533.834. 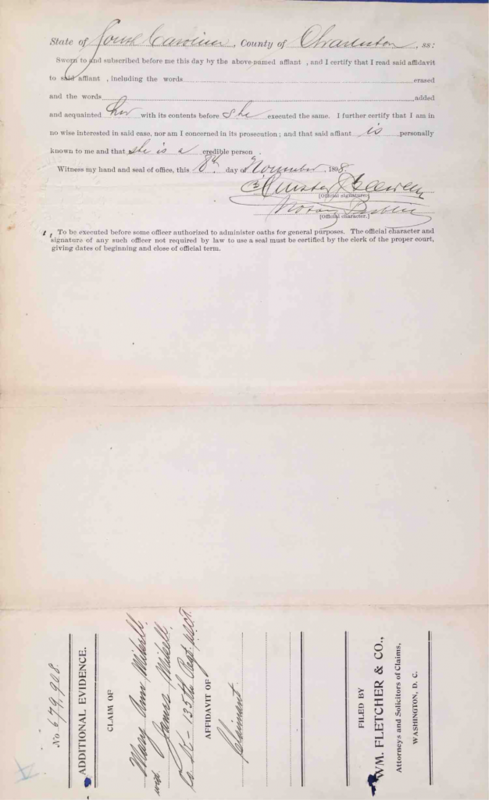 Mary Ann Walker filed for a pension as the widow of James Walker aka James Mikell. Her claim was assigned number 679.908. The claim was referred to a Special Examiner to determine whether she was the lawful widow of James Walker aka Mikell, whether she had remarried since his death, and the correct birth dates of her two living children under the age of 16. She was granted a pension of $8 per month that began 22 July 1989 for herself and her two daughters Minnie Victoria and Mary Bell Walker. Her pension certificate number was 533.834. 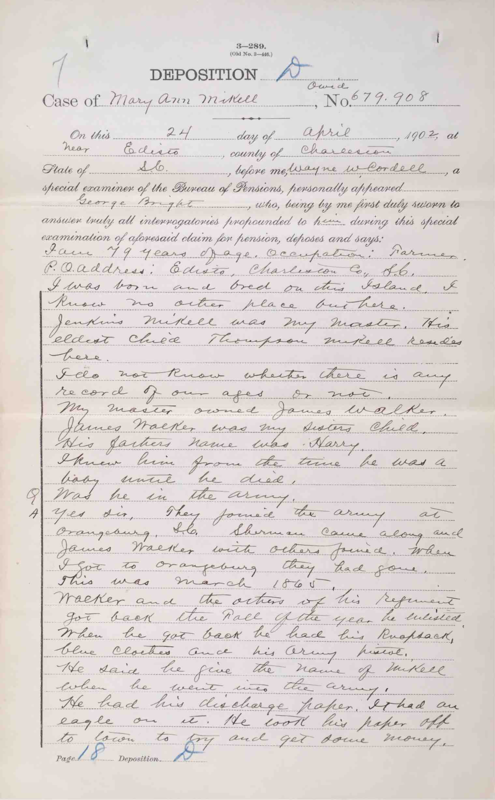 Summary of statement of Mary Ann Mikell, 25 June 1898: She was the widow of James Mikell who served in Company K, 135th Regiment US Colored Troops. He died 18 October 1894. She was married to him under the name Mary Ann Green on 4 January 1874 by Rev. A Murchison at Edisto Island, SC. She did not remarry after James Mikell died. Children under the age of 16 who were living at the time of her statement were: Minnie, born 26 December 1886 and Mary Bell, born 20 May 1891. A child, Nellie, born 2 July 1893, had died. 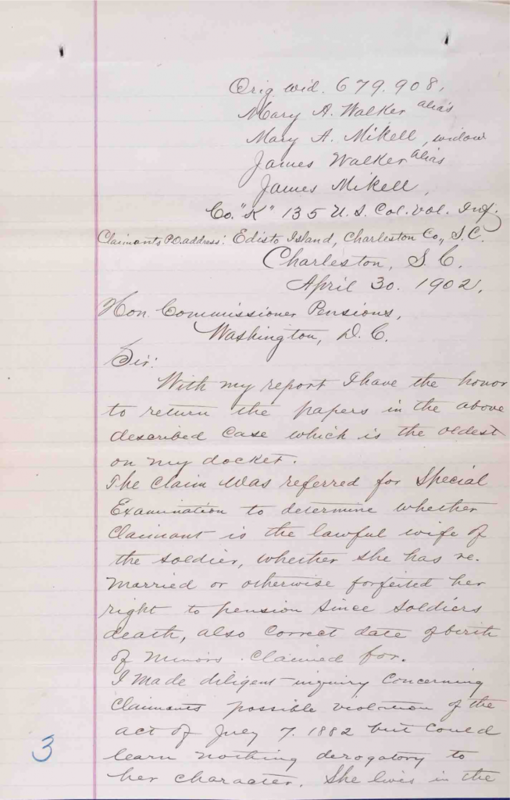 Testimony of Mary Ann Walker, USCT Pension File of James Walker aka James Mikell, Certificate #533.834. Summary of statement of Mary Ann Mikell, 23 September 1898: She was a resident of Edisto Island, SC. She reported that on a prior statement the Notary Public listed her daughter, Nellie, as still living. But the child had died about when she was about five months old. 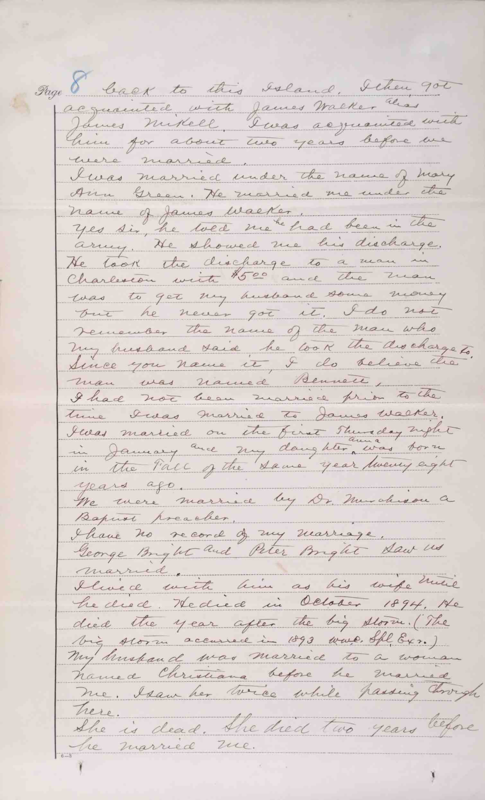 Summary of statement of Mary Ann Mikell, 1 August 1898: She stated her husband, James Mikell, died 18 October 1894. He was attended to by Dr. J.C. Woodruff in his last illness. She was given no death certificate. The doctor told her that James died of heart disease. She stated she had no means of support other than her daily labor in the field. She also stated she had no property except for possibly $10 or $15 worth of clothing and a bed. 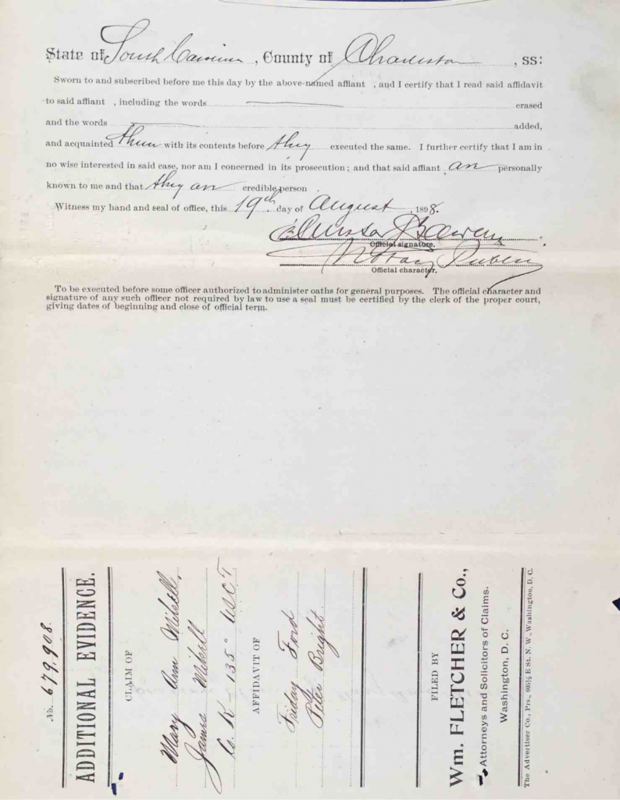 Summary of statement of Mary Ann Mikell, 8 November 1898: Mary stated her husband, James Mikell, was born on Peters Point Plantation, Edisto Island, SC but she did not know when. She stated he was about 5-feet 7-inches with black complexion, eyes and hair. She stated he had a considerable enlargement of a vein on his right leg that he did not have when he enlisted. He never lived anywhere other than Edisto Island. She stated James took his last name from the Mikell family who were his enslavers. His first wife was named Christiana. She also stated she could not furnish records on the birth of her children because their births were not recorded in the baptismal record. Only the date of their baptisms, when they were about 16 years old, was recorded. She stated she was never married to anyone except James Mikell and she did not marry after his death. She stated he had not been married to anyone other than his first wife, Christiana, and her. Summary of statement of Mary Ann Mikell, 8 December 1899: She stated she was married at the Baptist church on Edisto Island, SC by Rev. Murchison. 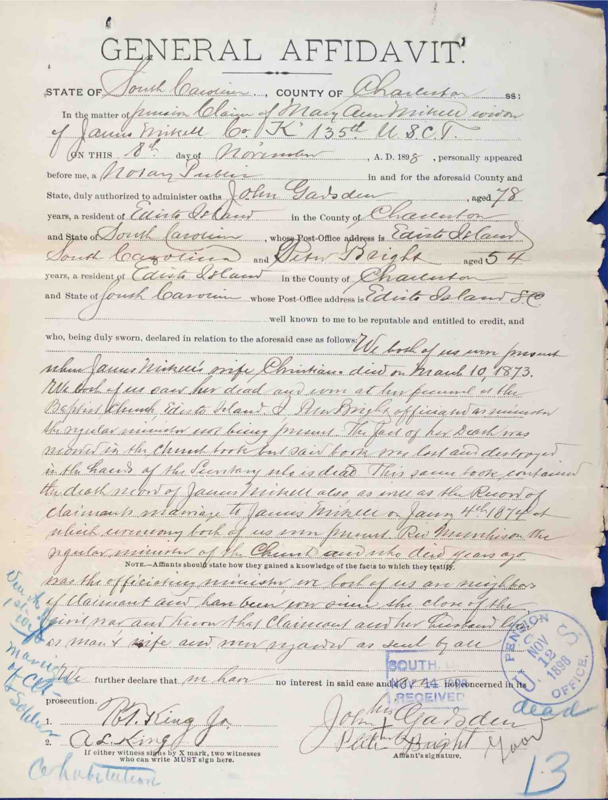 The marriage certificate was dated January 1874. Peter Bright and John Gadsden were witnesses. Her maiden name was Green. She did not remarry after James Mikell died. Summary of statements of Peter Bright and George Bright, 2 May 1900: They were residents of Edisto Island, SC and stated they were present at the death of James Mikell on 18 October 1894. They stated he died about 10 or 11 PM and was buried two days later at Peters Point Plantation. They knew Mary A. Mikell for about 35 y6ears and they were both present at her marriage to James. They had always been near neighbors and belonged to the same church (Baptist). Testimony of Rev. 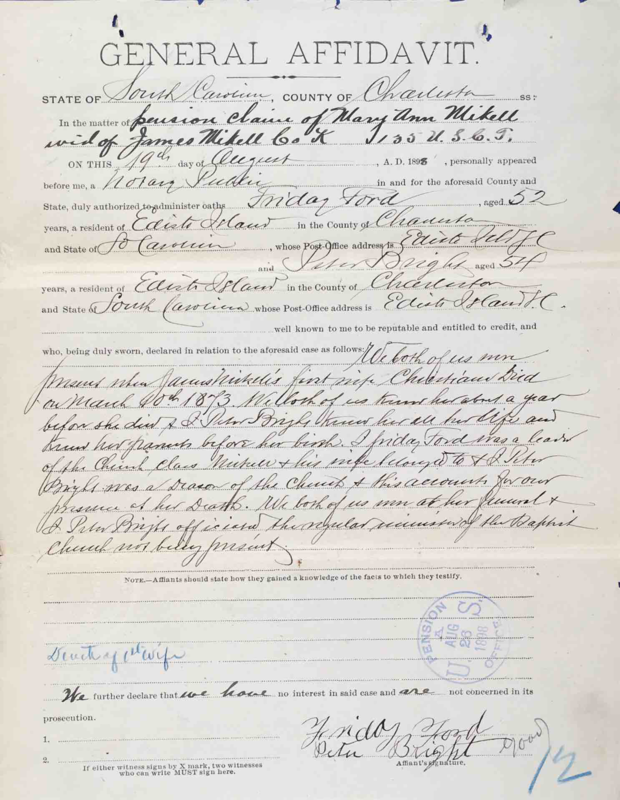 Peter Bright and George Bright, USCT Pension File of James Walker aka James Mikell, Certificate #533.834. 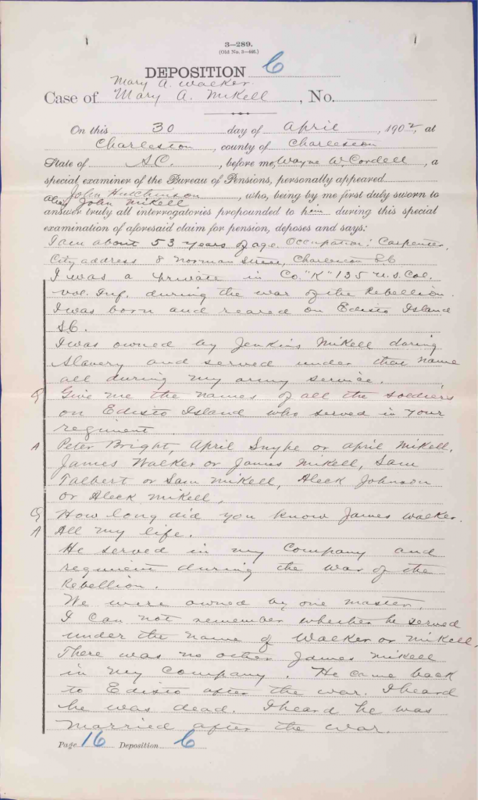 Summary of statements of Peter Bright and Moses Brown, 6 September 1898: They knew James Mikell for 10 years before he enlisted in the army. Peter Bright served in Company D and Moses Brown, then called Moses Irving, served in Company I. Both were in the 135th Regiment US Colored Infantry. They stated James could neither read nor write and when he gave his name at enlistment, it was written as Michall but the correct spelling was Mikell. Peter Bright was the minister of the Baptist church on Edisto Island, SC and officiated at James Mikell’s funeral. Moses Brown was at the funeral and had seen James prior to his death. They saw Mary A. Mikell, James’ widow, often and knew she had two children, Minnie and Mary Bell. Summary of statements of John S. Thorne and Peter Bright, 1 August 1898: They knew James Mikell and his wife, Mary Ann, since 1872, about two years before they married. James was then married to his first wife but she died about 1873. He married Mary Ann on 4 January 1874 and lived with her until he died. They knew Mary Ann supported herself by working on a farm belonging to her father-in-law. Her income did not exceed $50 and her personal property did not amount to $15. No one was legally bound to support her. Both John and Peter had lived near Mary Ann for about 24 years. Peter Bright was the minister of her church. 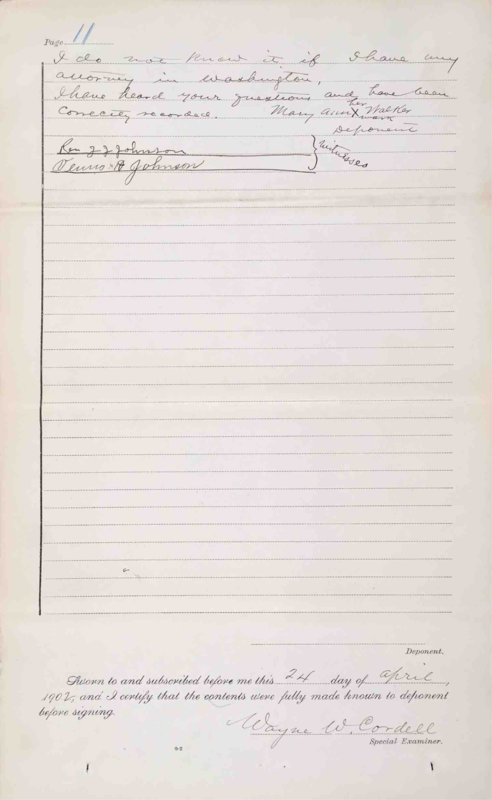 Summary of statements of James M. Eason and A.P. Cay, 26 September 1898: James M. Eason was the Auditor of Charleston County and A.P. Cay was the Clerk. They examined tax books and found no taxable property of any kind in the names of James Mikell or Michael, and Mary Ann Mikell or Michael. 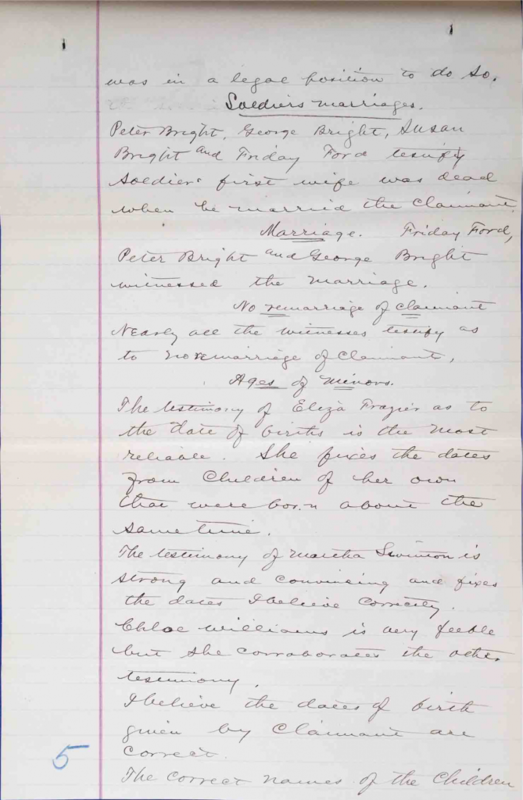 Summary of statement of Peter Bright and John Gadsden, 8 December 1899: They were both present at the marriage of James Mikell and Mary Ann Green in January 1874. They knew Mary Ann when she was a young girl and knew she had not been married before her marriage to James. Peter Bright was a minister of the church in which they were married. They both belonged to the same church as Mary Ann. Summary of statement of Friday Ford and Peter Bright, 19 August 1898: They were both present when Christiana Mikell, James Mikell’s first wife, died on 10 March 1873. Peter Bright knew her all her life and also knew her parents prior to her birth. Friday Ford was a leader of the church class that James and his wife attended. Peter Bright was a deacon of the church. They were both present when Christiana died and Peter officiated at the funeral since the regular minister was not present. Testimony of Friday Ford and Rev. 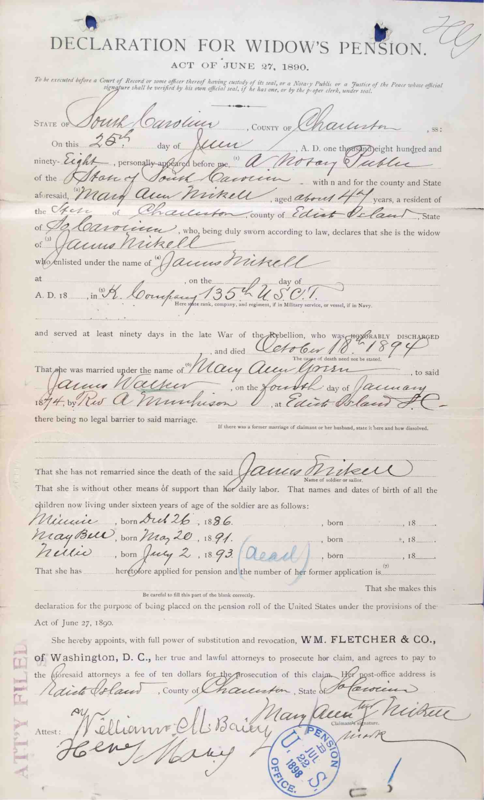 Peter Bright, USCT Pension File of James Walker aka James Mikell, Certificate #533.834. Summary of statements of John Gadsden and Peter Bright, 18 November 1898: They were both present when Christiana, James Mikell’s first wife, died on 10 March 1873. They saw her dead and were present at the funeral at the Baptist church on Edisto Island, SC. Peter Bright officiated as the regular minister was not present. Her death was recorded in the Church Book but the book had been destroyed. 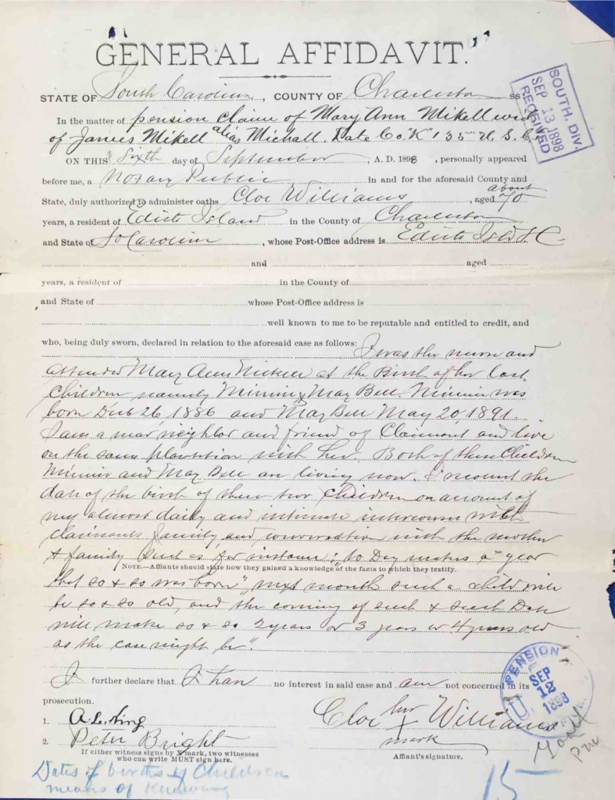 James Mikell’s death and marriage records were also recorded. James was married 4 January 1874. Rev. Murchison, the regular minister, performed the ceremony. Testimony of John Gadsden and Rev. 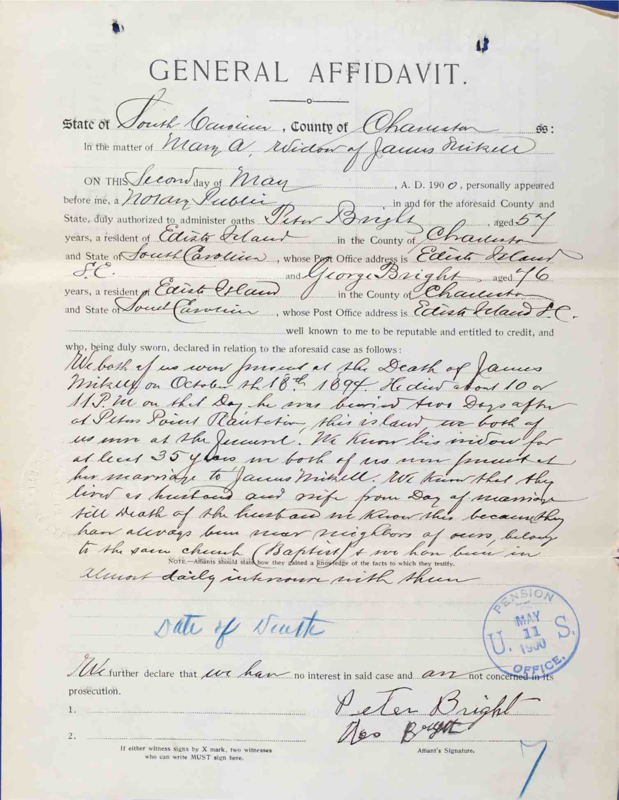 Peter Bright, USCT Pension File of James Walker aka James Mikell, Certificate #533.834. Summary of statement of Martha Swinton, 7 September 1898: She lived close to Mary Ann Mikell and her children, seeing her on a daily basis. She was present when Mary Ann’s children were born and was called to assist Cloe Williams. Martha knew Minnie Mikell was born 26 December 1886 and Mary Bell Mikell was born 20 May 1891. 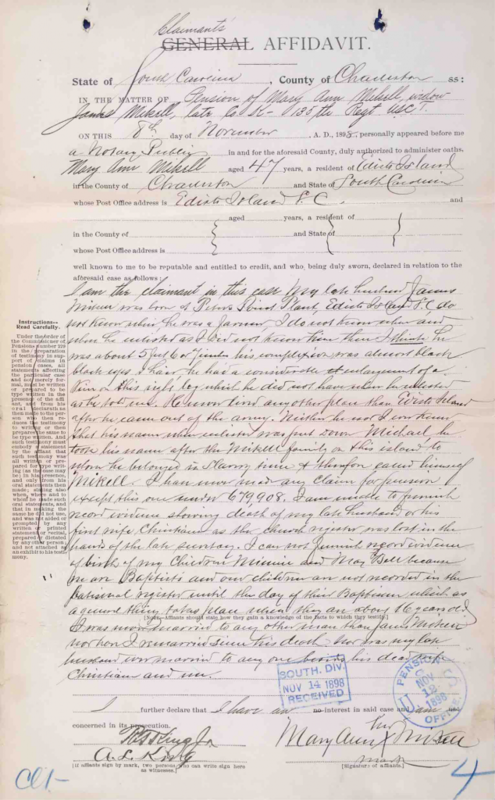 Testimony of Martha Swinton, USCT Pension File of James Walker aka James Mikell, Certificate #533.834. 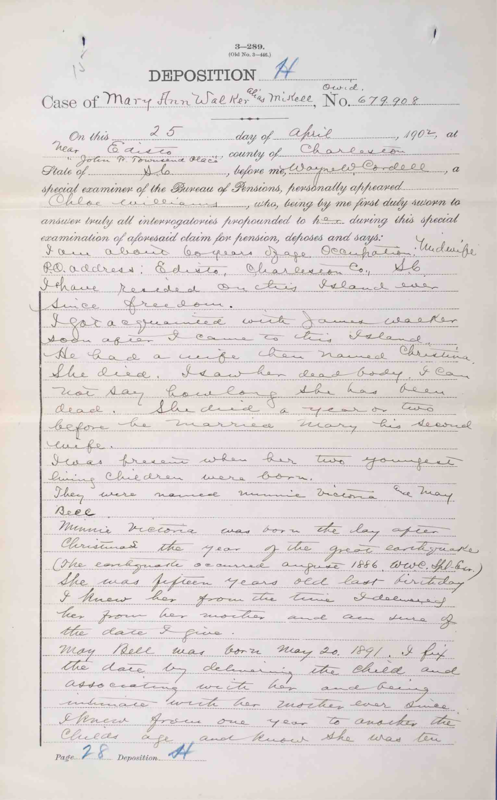 Summary of statement of Cloe Williams, 6 September 1898: She was the nurse and attended to Mary Ann Mikell at the birth of her last children, Minnie and Mary Bell. Minnie was born 26 December 1886 and Mary Bell was born 20 May 1891. Cloe lived on the same plantation as Mary Ann Mikell. Testimony of Cloe Williams, USCT Pension File of James Walker aka James Mikell, Certificate #533.834. 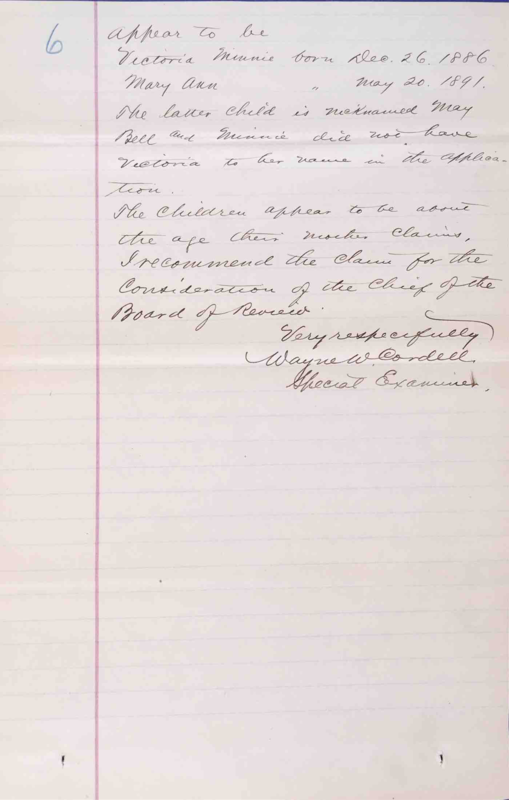 Summary of letter from Wayne W. Cordell to Commissioner of Pensions, 30 April 1902: Wayne W. Cordell stated he could find nothing derogatory about the character of Mary Ann Mikell. He stated she lived in the same house where James Mikell, her husband, died. She appeared to be a hard-working woman who had struggled to rear her children. Peter Bright and Major Frazier told Mr. Cordell that Mary Ann was quite young when she married James Mikell. James Mikell had been married before he married Mary Ann but his first wife had died. Children of Mary Ann and James Mikell were: Victoria Minnie, born 26 December 1886, and Mary Ann, born 20 May 1891. The latter child was nicknamed Mary Bell. 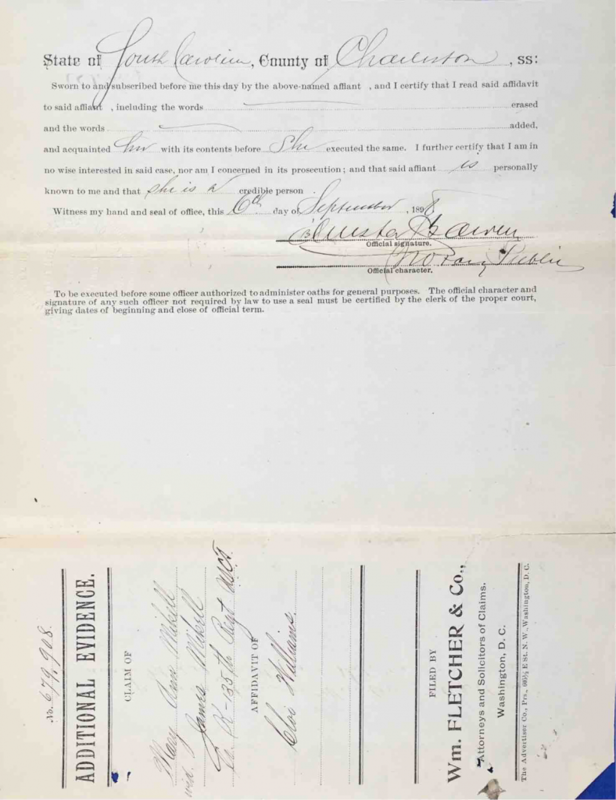 Report of Special Examiner Wayne W. Cordell, USCT Pension File of James Walker aka James Mikell, Certificate #533.834. Summary of statement of Mary Ann Walker alias Mikell, 24 April 1902: She was living on Edisto Island, SC and working as a housekeeper. She had claimed a pension as the widow of James Walker who served during the War of the Rebellion. She stated he had told her he served under the name of James Mikell. His master’s name was Jenkin Mikell and his father’s name was Harry Walker. Mary Ann stated James went by both Mikell and Walker. She stated she was enslaved by Whaley and her father’s name was Green. She said her parents went to Eight Mile, near Charleston, and stayed there about five years. She was small when this happened. She said this was at “…the first of freedom.” They then moved back to Edisto Island. She knew James Walker [alias James Mikell] for about two years before they married. He married Mary Ann Green under the name James Walker. Mary Ann stated she had not been married prior to marrying James. They were married “…on the first Thursday night in January…” and their daughter, Anna, was born in the Fall of that year, 28 years prior to this statement. Dr. Murchison, a Baptist preacher, married them. George and Peter Bright were at the wedding. Mary Ann said she lived with James until he died in October 1894, the year after the Big Storm. James had been married to Christiana but she had died two years before James married Mary Ann. She stated she had two children under 16 years of age when she applied for a pension: Victoria Minnie, born 26 December “…fifteen years ago…” and Mary Ann, nicknamed Mary Bell, born 20 May “…ten years ago.” She had sons, Cornelius and James who were born in July 1880 and October 1881 respectively. She stated James had complained of his breast and spit up lots of cold and consumption, causing his death. Peter Bright served in the army with James. April Sayre and Sam Talbert were in the same regiment as James but had died. Chloe Williams and Martha Swinton were present when Victoria Minnie was born. Mary Ann stated she did not remarry after James’ death and had lived in the same house where they lived together, rearing her little children. She stated she had a hard time getting along. 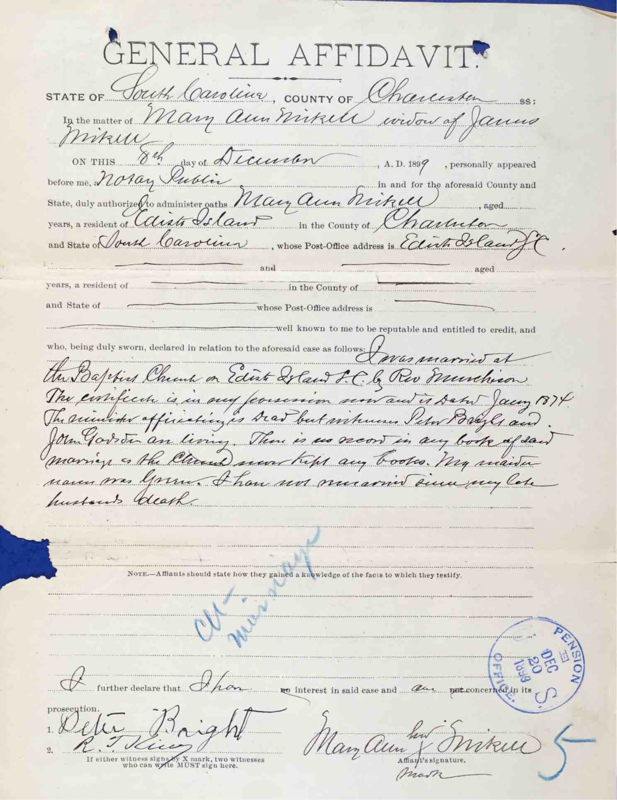 Summary of statement of Eliza Frazier, 25 April 1902: She stated Mary Ann Mikell’s child, Minnie Victoria, was born in December “…fifteen years ago.” “Mary Bell” was her youngest child and she was born about the last of May 1891. 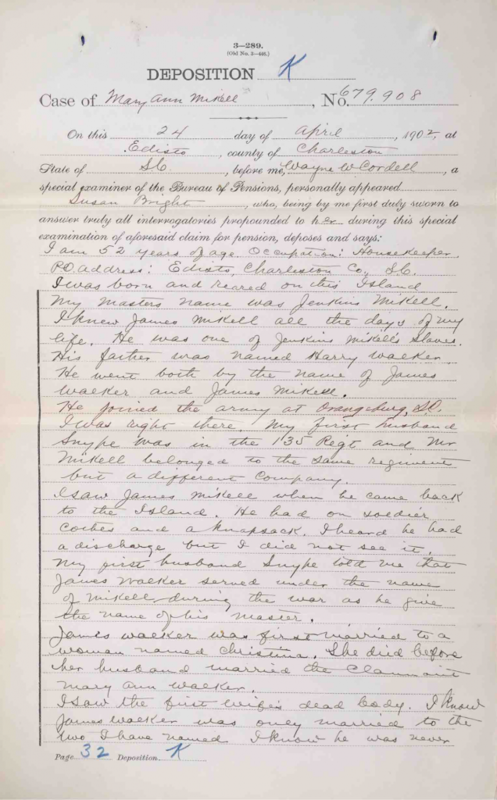 Summary of statement of Susan Bright, 25 April 1902: She stated her master’s name was Jenkin Mikell and that she knew James Mikell her entire life. He was enslaved by Jenkin Mikell. James’ father’s name was Harry Walker. James went by the name of James Walker and James Mikell. James joined the army at Orangeburg, SC. She saw James when he returned home from the army. Susan’s husband, Snype, told her James served under the name James Mikell. James Walker [James Mikell] was first married to Christina but she died before James married Mary Ann Walker. Susan saw Christina’s dead body. Susan said she did not see James’ dead body but her husband went to the funeral. She knew Mary Ann had not remarried after James’ death. 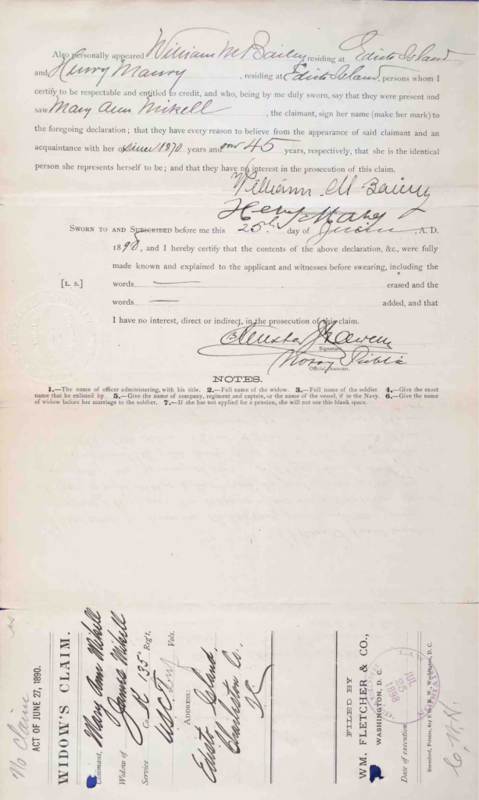 Testimony of Susan Bright, USCT Pension File of James Walker aka James Mikell, Certificate #533.834. 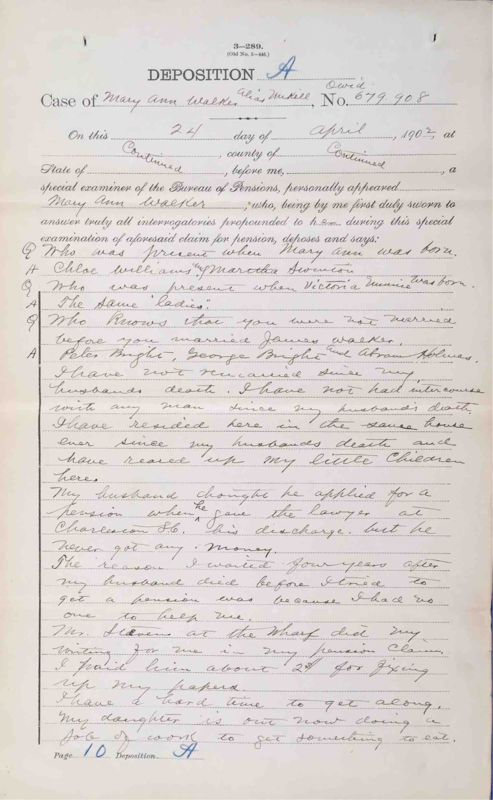 Summary of statement of Major Frazier, 24 April 1902: He said Mary Ann Mikell was a single woman when peace was declared. He never knew her to have but one husband, James Walker. Major stated that James died about 1894 or 1895. He knew James’ master was named Mikell. Major was present at James’ death and “…helped make the box that held his dead body.” He stated he had never heard Mary Ann’s virtue questioned and knew she had not remarried after the death of her husband. 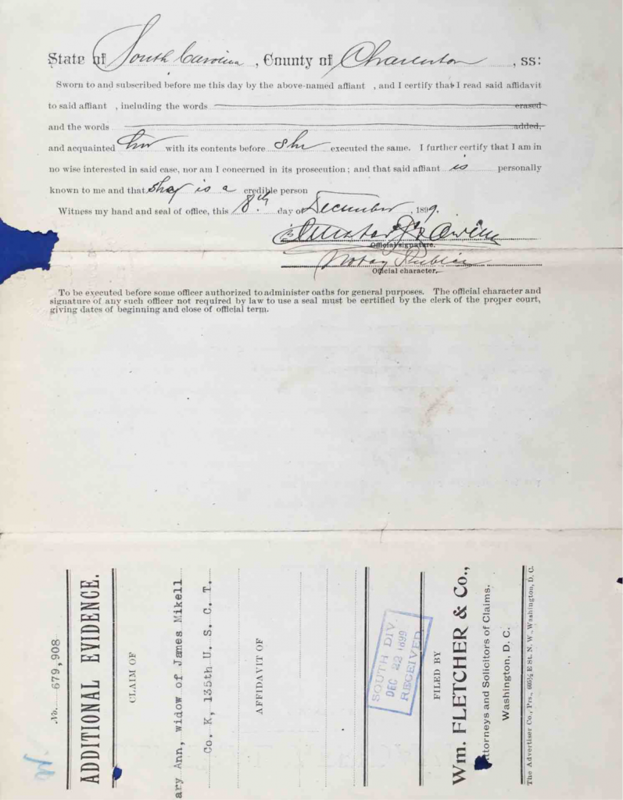 Summary of statement of Chloe Williams, 25 April 1902: She became acquainted with James Walker soon after she began living on Edisto Island, SC. He was married to Christina at the time but Chloe knew Christina had died because she saw the dead body. Chloe was present when Mary Ann’s two youngest children were born. She knew Mary Ann had no man after her husband’s death. 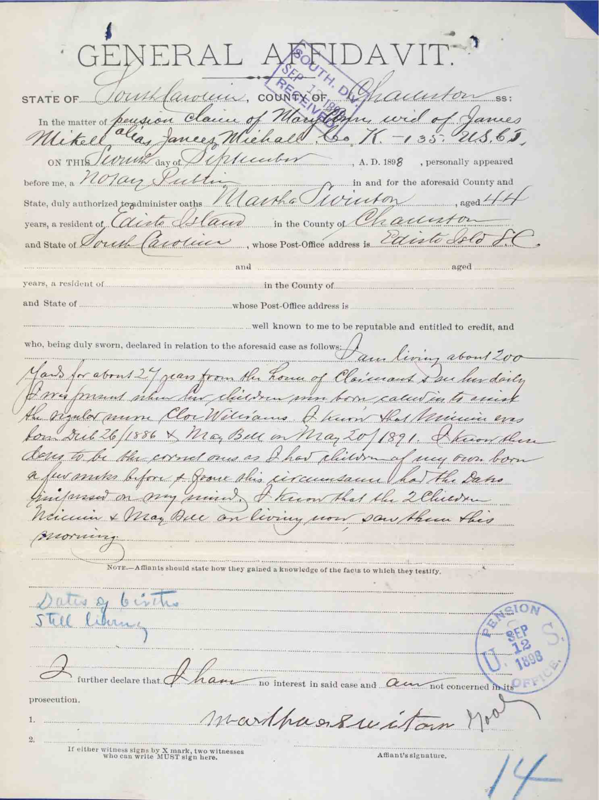 Summary of statement of Martha Swinton, 25 April 1902: She was present when Minnie Victoria Mikell was born 26 December 1886. She was also present when Mary Bell was born 20 May 1891. She had children about the same ages as Mary Ann’s children and that was how she was able to remember their birth dates. 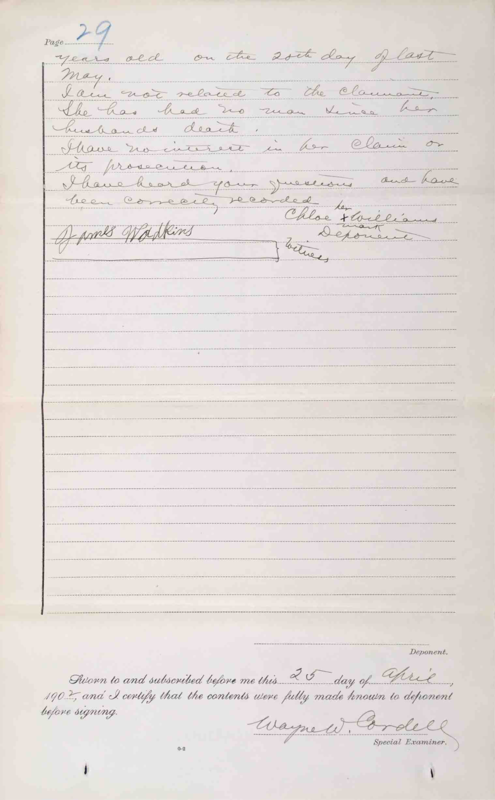 Summary of statement of Friday Ford, 24 April 1902: He knew James Walker from when James was a boy. He knew James was enslaved by Jenkins Mikell. James Walker went by the name James Mikell when he joined the army. Friday was present at the marriage of James and Christina, James’ first wife who died about 1872. He was also present when James married Mary Ann Green. He was present when James died and knew Mary Ann had not remarried. Summary of statement of John S. Thorne, 25 April 1902: He was acquainted with James Walker in 1872. He knew James had been married before he married Mary Ann but his wife had died about 1872. Then he married Mary Ann about a year after James’ first wife died. James and Mary Ann were married until James died. Mary Ann’s children, Mary Bell and Minnie were living at the time of his statement. Her daughter, Nellie, was living in 1898. 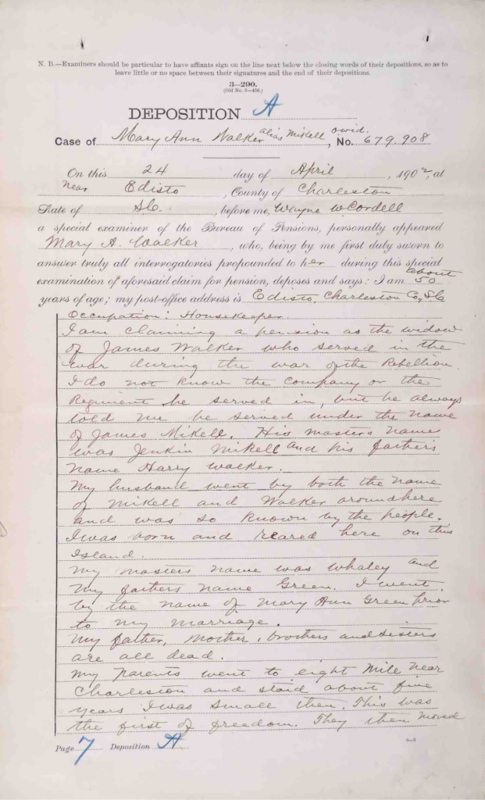 Summary of statement of George Bright, 24 April 1902: He stated Jenkins Mikell enslaved James Walker and that James was George’s sister’s child. James’ father was named Harry. George said he knew James from the time he was a baby until he died. He knew James had joined the army at Orangeburg, SC when Sherman came along. This was about March 1865. When James returned home from the army, he had his knapsack, blue clothes, and his army pistol. He showed George his discharge paper. “It had an eagle on it.” He knew James had been married to Christina who died in 1872. He married Mary Ann Green about 1873. George helped carry the dead body of Christina to her grave. She was the child of George’s first wife. Preacher Murchison married James Walker and Mary Ann Green. James and Mary Ann Walker lived together as man and wife until James died. George stated that James “…died within 20 steps of my house. I saw him die and washed him and assisted in burying him.” He stated that Mary Ann, James’ widow, was almost destitute. She had 9 acres of land valued at $81 and had worked hard to raise her children. She had no other property, real or personal. Mary Ann had a good reputation and had not remarried after her husband’s death. Testimony of George Bright, USCT Pension File of James Walker aka James Mikell, Certificate #533.834. 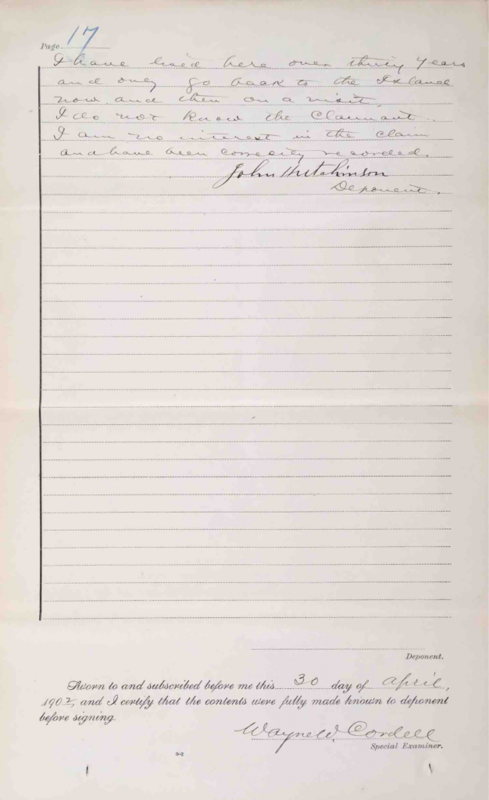 Summary of statement of John Hutchinson alias John Mikell, 30 April 1902: He served in Company K, 13th Regiment US Colored Volunteer Infantry. He was enslaved by Jenkins Mikell. The soldiers on Edisto Island who served in his regiment were: Peter Bright, April Snyke or April Mikell, James Walker or James Mikell, Sam Talbert or Sam Mikell, and Aleck Johnson or Aleck Mikell. John Hutchinson and James Walker were enslaved by the same master. He stated James returned to Edisto Island after the war ended. 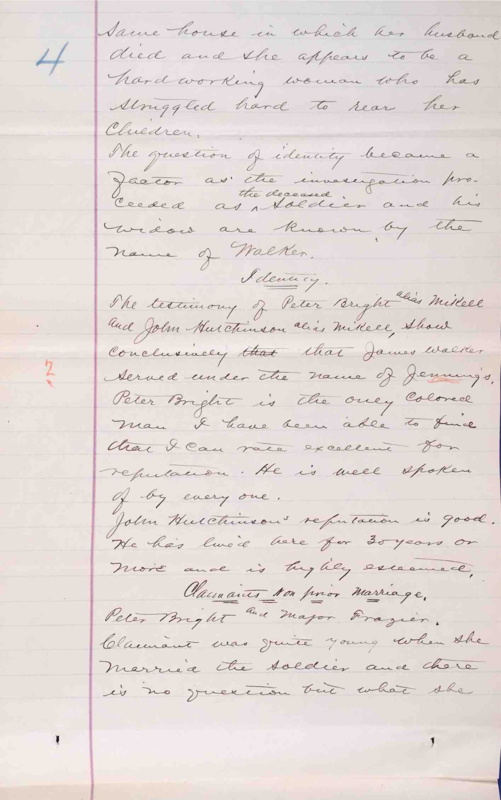 Testimony of John Hutchinson, USCT Pension File of James Walker aka James Mikell, Certificate #533.834. 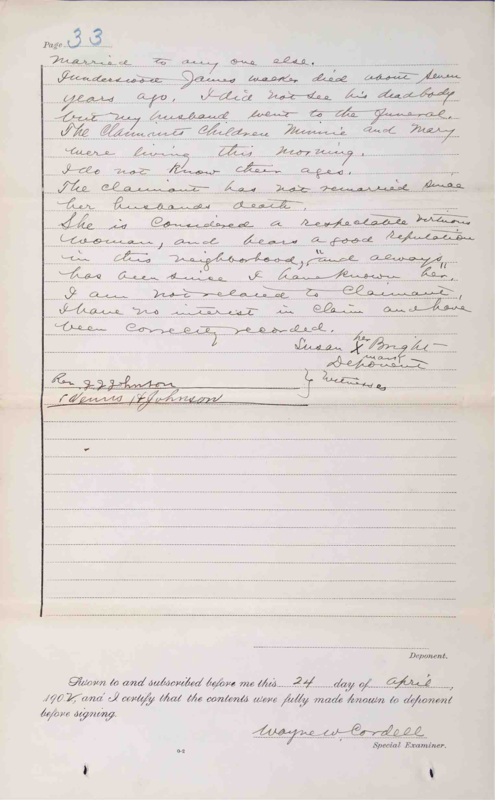 Summary of statement of Peter Bright, 24 April 1902: Peter stated he knew James Walker all his life. Peter was enslaved by Jenkins Mikell during slavery and so was James. Peter said James’ mother was living on his place and she was 78 or 79 years old at the time of his statement. Peter and James enlisted at Orangeburg, SC at the same time. James enlisted under the name James Mikell. He said the two of them were camped and located together all the time during their service. They returned home from the service together. Peter stated James Walker never lived with any woman as their husband except for Christina, his first wife, and Mary Ann Green, his second wife. Peter saw James’ dead body. It was carried in his cart and Peter did not leave it until it was buried. Peter was present when James married Mary Ann Walker. Rev. Dr. Murchison married them. Mary Ann never lived as a wife to anyone but James Walker. Ella Walker and Peter Bright, 1900 US Census.Year: 1900; Census Place: Edisto Island, Charleston, South Carolina; Page: 24; Enumeration District: 0118; FHL microfilm: 1241521. Ancestry.com. 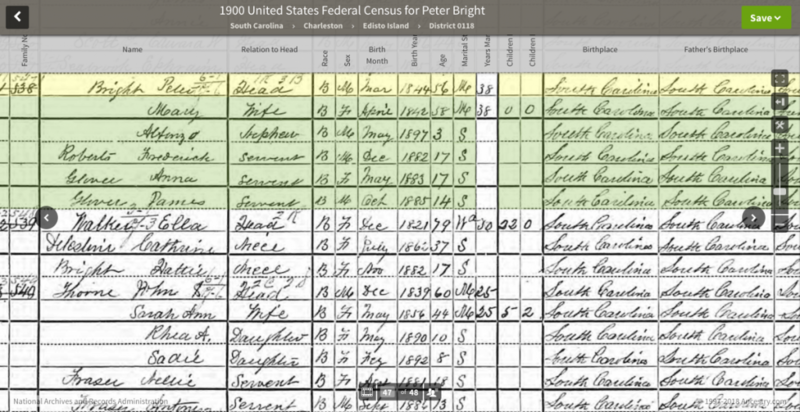 1900 United States Federal Census [database on-line]. Provo, UT, USA: Ancestry.com Operations Inc, 2004. Original data: United States of America, Bureau of the Census. Twelfth Census of the United States, 1900. Washington, D.C.: National Archives and Records Administration, 1900. T623, 1854 rolls.